However you look at it, inflight entertainment is very poor in US Airways, and is miles behind what many other airlines offer. Indeed, it can be something of a shock taking a long haul flight on US Airways: If you like films, free entertainment, and come to that a free beer, you might be better off at looking at British Airways or Lufthansa, or really any other airline transatlantic. Whether you get a seatback TV screen - or indeed any screen - depends on the aircraft you are on, and come to that which class you are sitting in. On the Airbus A330 in Business Class in an Envoy Sleeper Seat or on the Cirrus Business class seat there is a decent AVOD TV Screen, plus an EmPower power outlet. In economy a few of US Airways A330s have been retrofitted with seatback TV screens, however in most US Airways Airbus A330 in economy there is just an overhead TV screen, showing one film, followed by one or two TV programmes. The films are pretty rubish, being lower-ranking hollywood comedy films that have generally sunk without trace. It is unlikely you will even know some of the TV programmes. You have to pay $5 for headphones, which have a two-pronged plug. If you pay up for the headphones, you can of course take them off the flight, but they are pretty useless things you probably don't want - regular passengers take their own headphones, and a two-pronged adaptor. On the Boeing 767-200ER there is no inflight entertainment, however in Business Class you get a AVOD device handed to you after takeoff. There are overhead TV screens in economy. 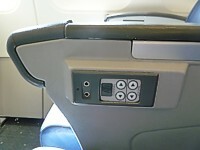 On the Long-Haul Boeing 757 there is a 110 V AC power outlet at each seat, but no seatback TV. However in business class personal entertainment devices are handed around on takeoff. Be warned that USAirways the only legacy carrier to offer absolutely no form of entertainment for domestic travel. The exception is the domestic flights which really feel like long haul: Hawai'i and Alaska (from Philadelphia). On these routes there are small CRT overhead monitors on the Boeing 757. These show one film. You have to pay US$5 for headphones. Well, at least you can say there is one. 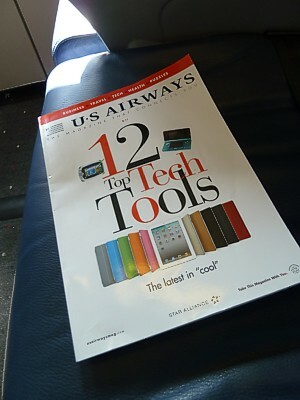 US Airways still has an inflight magazine, but it's pretty poor. A typical non-descript US publication, it's stuffed full of adverts on how to get rich quick, with adverts for MBAs, investment schemes, and property. The actual content is OK, but not that inspiring. Worst is the presentation and layout. Get used to lots of serrif fonts, and big blocky borders. In the last few pages are the inflight menu, and a list of what films will be shown on the overhead entertainment (if there is any).